Feeling froggy, are ya? 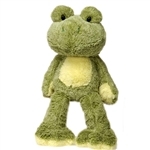 Our stuffed frogs and plush frogs have been hopping mad that they are stuck here with us. They want to get off of our pad and see the world. We treat our stuffed frogs and plush frogs great but they aren't tadpoles anymore so they are ready to jump to a new home and make some new friends. Sure, we'll miss our stuffed frogs and plush frogs but we've got so many that we just can't give them the attention that they deserve. That's where you come in. Surely you could use a stuffed tree frog, a plush poison dart frog, or maybe a stuffed frog puppet. Just scroll through our stuffed frogs and take your pick. We also have some stuffed toads and plush toads tucked away with the stuffed frogs. We know there's a difference, but the stuffed toads said they didn't mind hanging around with the stuffed frogs. If you have any trouble choosing a stuffed frog or stuffed toad, give us a call and we'll do our best to make it easy being green.